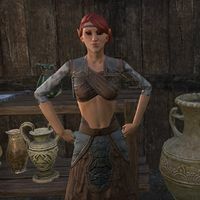 Lorthodaer is a Bosmer guild trader who can be found at her stall, Green Goods & More, in Vivec City. When spoken to she will say "Greetings". This page was last modified on 30 May 2018, at 03:09.